4-Word Review: They have their kids. Philippe (Frank Langella) works at a high-tech job in a large corporation. For years he has been giving trade secrets to a mysterious organization that pays him handsomely for his efforts. Now that he is married and has children he has decided he no longer wants contact with this underground entity, but they refuse to leave him alone. When he is no longer willing to corporate they kidnap his two children, which sends his emotionally and mentally fragile wife Jill (Faye Dunaway) over-the-edge. Dunaway’s amazing performance is the one thing that really helps propel a film that is otherwise too laid-back. I have always been an admirer of hers, but her performance here is great because it is so different from any of the other characters that she has played. Normally she is cast in parts of strong or manipulative women, but here she plays someone who is very fragile and does it with amazing effectiveness. I felt like she was a completely different person and showed a side to her that I didn’t think she possessed. Her face and expressions accentuate the fragility and she looks quite beautiful. Langella is good on the opposite end. He plays a cynical and aloof man who snaps at his wife in an annoyed manner at regular intervals. The contrasting personalities and dialogue between them is interesting. In many ways he seems to playing an extension to the character that he did in Diary of a Mad Housewife and given the fact that Eleanor Perry wrote the screenplays for both films makes me believe that there had to be more than just a passing connection there. The story has some interesting underlying elements that manage to retain a modicum of intrigue, but Rene Clement’s direction is too leisurely. The first hour gets bogged down with too much conversation and certain tangents that go nowhere. It is only in the last half hour that things finally get going and has some interesting twists, but by then it is too late. It would have been better had we seen some sort of face to the organization instead of having them portrayed in such a vague way. The movie is also in need of a lot more action although the part where Jill and her kids get into a car accident and get thrown from the vehicle is impressive since actual bodies where used, which is something I had never seen done before. The film features several loopholes that will end up confounding anyone. One is that when the children are kidnapped they are locked in an upstairs room that has a loaded gun stashed away in the closet. The children get their hands on it and use it against their captors, but you would think that a sophisticated and large criminal group that this organization supposedly is wouldn’t be so utterly careless as to leave it there. 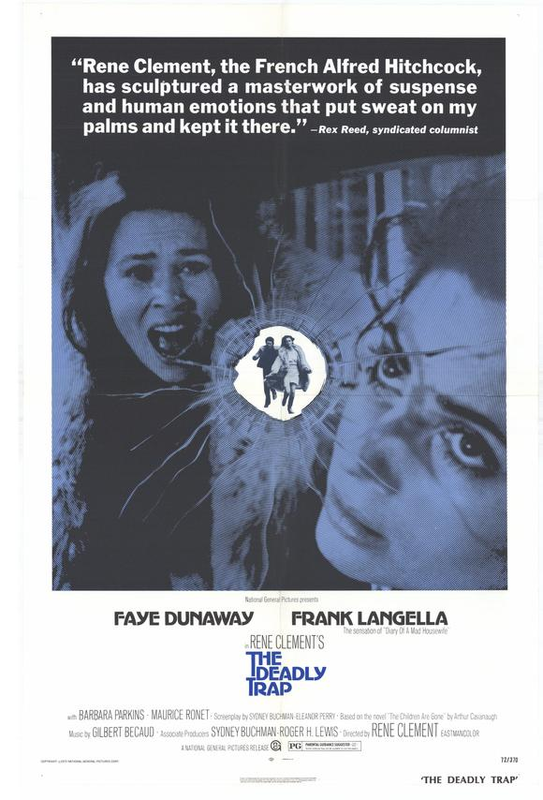 Also, when it is found that the couple’s downstairs neighbor Cynthia (Barbara Parkins) has a connection to this organization and kidnapping the police shoot her dead at point-blank range instead of just arresting her and interrogating her in order to find the whereabouts of the kids. The biggest problem though is the ending itself where the kids are saved and everybody becomes one big happy family, which doesn’t jive at all with the rest of the film that had a constant murky undertones and a couple that was always squabbling. By having this otherwise dark thriller suddenly become ‘The Brady Bunch’ at the end is jarring in tone. It also doesn’t answer the fact that the organization was never caught and therefore will continue to harass him again, so why should they be all happy when the bad guys could strike at any moment? This entry was posted in 70's Movies, Drama, Foreign Films, French Films, Kidnapping Movies, Movies Based on Novels, Mystery, Obscure Movies, Thrillers/Suspense and tagged Entertainment, Faye Dunaway, Frank Langella, Movies, Rene Clement, Review. Bookmark the permalink. Barbara Parkins’ character wasn’t shot by the police, but by the Organization for betraying them. Deadly claptrap. Dreadful direction, confusing, unresolved narrative, the actors are poorly served and it’s truly pointless and a ponderous non thriller! A near atrocity!